Among the latest developments in machine tools are the heavy milling machines, which are built broadly on the planer type. All the early milling machines were of small dimensions, were lightly built, and designed only for those classes of work for which Lincoln and Universal machines are still chiefly used. A great change came with the introduction of the planer type, with a cross rail on housings, carrying vertical, or horizontal spindles and arbors, and a long bed on which the work is traversed beneath the cutter. The term "piano-miller" is often applied to this type, and also "slabbing machines", the latter term being of more general use in American shops. The question of spindle arrangements and their details is a secondary one, but in strictness a horizontal spindle is generally understood by the term piano-miller. The main feature of all these machines is that the table is long, and has a long traverse by comparison with the tables of Lincoln millers. They are, therefore, both in their build and in the dimensions of the work clone upon them, the present rivals of the planing machines, after the patterns of which they are built. The important questions of degree of accuracy and the smoothness of finish produced on the common planer, and on the plano-milling machine cannot be settled in an absolute manner. Differences of opinion exist among managers with regard to these matters. But the writer's experience is this; that the differences which exist are, in the main, those due to good, bad, and indifferent machines, and conditions of practice, rather than to anything of an absolute character. You may have good, bad, and average practice either in planing, or in milling, and those whose experience has lain in one class alone will thus have their opinions biased. There is no man more dogmatic than a workman whose practice has run in one narrow groove. The conditions which are essential to good results, both in planer and miller, are—absolute rigidity of framework, proper formation and fixing of the cutting tools, and general handiness. In the absence of these, neither machine will prove economical, and the marks of vibration and chatter will be apparent both in heavy and in light finishing cuts. 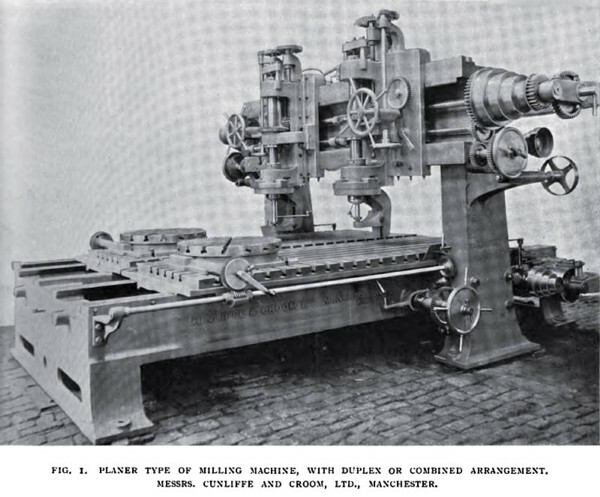 On planer and miller alike, broad finishing cuts will show lines and ridges that look unsightly even if they do not matter so much in regard to fitting, as in the case of the rougher classes of work, and in work that has to be ground afterwards, or in which the surface is tooled for good appearance only. But it is not good economy to retain any machines that cannot be depended upon to produce good results without lessening the depth of cut to a microscopical amount. Even if work may be left rough, or if it has to be ground or scraped, the milling machine or the planer should be capable of taking a broad slogging cut without any very perceptible chatter. But in the more intelligent and eclectic practice of the present day the two machines often become mutually helpful. It is difficult to mill very broad surfaces quite accurately on account of the springing of the long arbors, which cannot be entirely eliminated. Yet the advantages of dealing with broad surfaces at a single traverse are so great, from the point of view of economy and approximate accuracy, that it is very desirable to be able to substitute the broad cutter, or gang of built-up cutters, for the single edged tool. And so we frequently find that broad surfaces are roughed out with gang cutters, and finished on the planer with a single edged tool. The great objection to this is the necessity for moving and resetting the work, which is a thing to be avoided, unless in cases where the advantages gained outweigh the loss of time involved in resetting. The utilities of the piano-milling machine when brought into rivalry with the planing and shaping machines, using single edged tools only, are so apparent on some classes of work, that the inevitable result has been that from simple types, other and more complex machines have been, and are still being, derived, with greatly extended ranges of capacity. The planer type of machine is modified in the following ways: Spindles and arbors are either vertical, or horizontal. Sometimes the cross rail is omitted, and two spindle heads slide upon the faces of two housings. Each housing has a horizontal adjustment along the wing beds that flank the main bed. The heads are elevated or lowered simultaneously by vertical shafts and gears, the motion of which is derived from a horizontal shaft. Here the resemblance to the Lincoln machine is very close. Many machines which belong properly to the class of plano millers combine vertical and horizontal spindles. 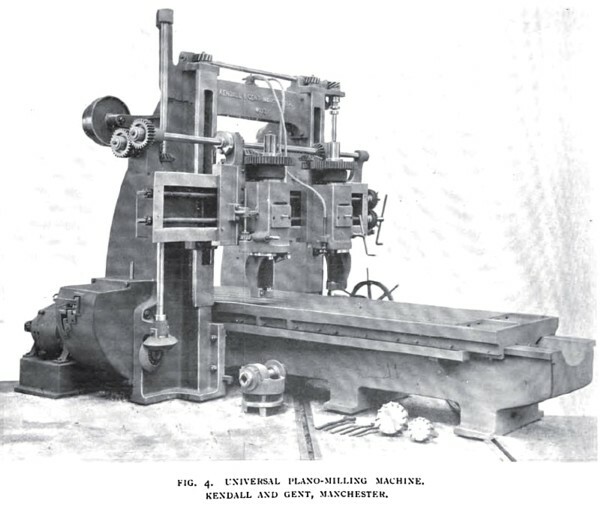 Many, again, are open-side machines, either temporarily converted, or of the permanent open side type, that is where one housing is entirely omitted, and in which the vertical spindle or spindles are carried on an arm that overhangs, from one housing, upon which it has vertical adjustment. The same upright may carry a horizontal spindle as well. These machines fulfil similar functions to, and possess the same advantages as the open-side planers. One modification of this design resembles the pillar and knee machines. Instead of housings, an arm is bolted upon the top of the pillar, carrying vertical spindle heads on its face. The outer end of the arm is supported by a bracket attached to the outer end of the knee. The most complete types include both horizontal and vertical spindles, for performing simultaneous or separate sets of operations. 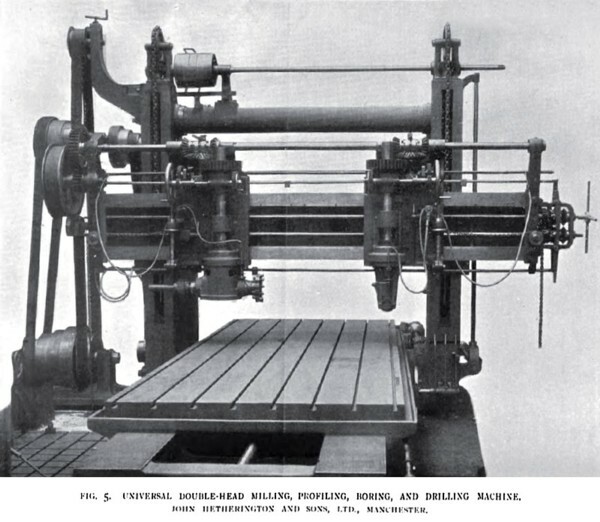 In these combined machines the saddles for the vertical spindle or spindles are carried on the cross rail, and those for the horizontal spindle on the vertical faces of the housings. They are usually independent. In some machines they can be united to move vertically as one. Frequently two vertical spindles are fitted to the cross rail, making four spindles in all, capable of simultaneous operation, two on faces, and two on edges—in this feature resembling closely the four-headed planing machines; and. of course, edge mills, or face mills can be used on either vertical or horizontal spindles. These are the main features of such machines. The variations in types necessarily modify details, besides which the designs of different manufacturers are marked by considerable differences. The leading features which should characterize a high class plano-miller are the following: A wide range of feeds for the table. In heavy milling, from 3 in. to 4 in. a minute may be taken as a suitable mean. Slower feeds are sometimes required, and others considerably higher, up to 8 in. or 10 in. a minute for fine finishing. The table is capable of adjustment by hand for setting work. It should also be adjustable by power in either direction, usually at a rate of about 30 ft. per minute. The cutter speeds range from about 6 to 40 revolutions per minute, variable through eight changes or more. The mass of the cross rail is, in most cases, counterbalanced, and is capable of vertical adjustment by hand or power, to graduations in thousandths of an inch, or by metric divisions. The spindle head has a certain amount of adjustment by hand along the cross rail, and also vertically, by fine graduations. By this last, the exact depth of cut is regulated, after the cross rail has been set approximately. No very exact classification of machines of the planer type is possible beyond that just outlined, since they vary so much in detail, and have, in the hands of various makers, become so highly specialized—as will be seen from the illustrations. These variations render necessary a somewhat hard and fast classification if we are to give a representative selection. It will therefore be convenient to take the vertical spindle machines chiefly in this article, leaving most examples of the horizontal spindles and composite machines for treatment in another. A very advanced machine is shown in fig. 1, by Messrs. Cunliffe and Croom, Ltd., of Manchester. It is a duplex miller, in which the tables can be run in unison or separately. The tables measure 10 ft. in length by 3 ft. 6 in. in width, and the distance between the uprights is 8 ft. There are also two circular tables, removable, of 2 ft. 6 in. diameter. Everything is massive, as required for heavy marine, locomotive, and general work. It weighs 20½ tons. The range of operations, which can be done on such a machine, is very extensive. The two rectangular tables render it more adaptable than a single wide one. In the latter case, a small piece will often have to monopolize the table, leaving a large area unoccupied. Or if dissimilar pieces are put on, it may not be possible to arrange one speed and feed adapted alike to each. But with two independent tables, and heads, each with its own variable feeds and speeds, this can be readily done; and the advantages of the broad table for large masses are still secured by coupling them. Another advantage is, that one table may be running, carrying work being tooled, while the attendant is setting work on the other table. Again, such pieces as bossed levers and connecting rods, which have had their webs tooled parallel on the long tables, can have their ends finished on the circular tables. The feeds of the rectangular tables are self-acting and variable, and they have a quick return in both directions by power. The movements of the circular tables are also self-acting through worm gear. The spindles on the two heads are driven through double gear. But when light cuts only are wanted, or when milling brass, the back gear is thrown out. The lower ends of the cutter arbors are supported with a bracket when edge milling is being done. This bracket can be swiveled. The spindles run in conical bearings. Each head has its own independent driving, feed, and reversing motions. In a three-spindle machine of another design by the same firm, carrying three vertical spindles, and weighing 13 tons, the table is nearly square, measuring 7 ft. long by 6 ft. wide; the machine being designed chiefly for broad face milling. Each spindle is driven from a single splined shaft, having its bearings above the cross rail. The latter has vertical adjustment on the uprights, and the spindle heads each have separate horizontal adjustments along the rail. The central head has a self-acting horizontal feed along the rail. The vertical adjustments to each spindle are by hand. The spindles are 4½ in. diameter. The table has four changes of feed, through gears enclosed in a box and a quick return by power. A very fine example of a heavy milling machine by Wm. Muir and Co., Ltd., of Manchester, is illustrated in fig. 2. It is treble geared, its spindle measures 4 in. in diameter, its bed is 18 ft. in length, the rectangular table measures 12 ft. by 4 ft., its circular table is 2 ft. 6 in., and the machine weighs 13 tons. Samples of work done upon it are seen in the connecting rods, and slot link, lying on the ground. It is rendered adaptable to a wide range of general work by the inclusion of a profiling attachment, which, of course, does not affect its usefulness for plain milling. Some of the principal details are as follows: The bed contains a cistern for the lubricant, of soap and water, which is forced up to the cutters by a centrifugal pump, and the table has a trough round its outer edges to receive the lubricant after use, whence it drains back to the cistern in the bed. The motions of the table are selfacting in each direction, with automatic reversal. Provision is made for a quick traverse by power also, and there is also a hand feed motion. The feeds range from ½ in. to 3 in. per minute. The rotation of the circular table is self-acting by worm gear. It is, of course, removable. The rigidity of the spindle head is ensured by making the cross rail and uprights in one massive casting, of boxed pattern, and by making the bearing surfaces of large area. The transverse movements of the spindle head are variable, and self-acting; the reverse is also automatic, and each movement can be hand-operated. The range of the horizontal motion of the spindle in this machine is 4 ft. 11 in. The slide which carries the spindle has a vertical adjustment of 12 in. by hand wheel and screw. Much care is taken in the fitting of these parts. The spindle runs in conical bearings of gunmetal, with lock nuts, and an adjustable tail pin of steel. Indexed steel rules are fitted, both to the rectangular table, and to the vertical transverse slides, and the circular table is graduated. The profiling attachment is capable of shaping objects measuring up to 12 ft. in length, by 18 in. in width, and 5 in. in depth. Cutters ranging from 2 in. to 18 in. in diameter can be used, each running at suitable speeds. A more massive machine by this firm, recently completed for a large railway company, is shown in fig. 3. Some idea of its proportions may be gathered by noting that the distance between the uprights is 8 ft., that the spindles are 4 in. in diameter, and that the weight is 50 tons. Each spindle is driven independently by its own electric motor, and each can be used as a profiler, as well as for plain work. Fig. 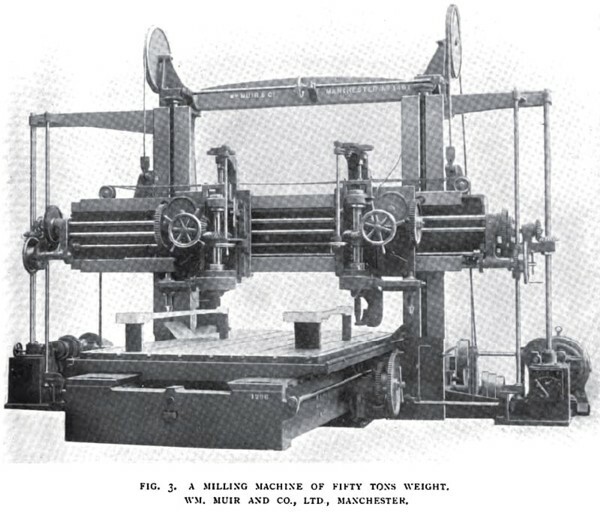 4 illustrates a machine by Messrs. Kendall and Gent, of Manchester, in which, in addition to the two vertical spindles, there is a supplementary horizontal spindle fitting; seen lying on the ground. This can be set to any vertical angle, and so renders the machine universal as regards angular work. The driving is by a motor at the rear end; and changes of feed are effected by a nest of gears contained in a box in front of the motor. A length of 10 ft. can be milled on the table of this machine. The rates of feed for the various steps on the cones are read off on an index plate. The lower bearing of each spindle has a vertical fine adjustment for putting on the cut, when using face mills. The traverse of the spindle carriage is self-acting in each direction, and it has hand movements also. The same remark applies to the table feeds. Graduated rules and pointers are fitted, and pump, tanks, and fittings for lubrication. Fig. 5 illustrates a heavy universal machine of rather special type, by the firm of Messrs. John Hetherington and Sons, Ltd., Manchester, of which they manufacture several varieties. This example is designed more particularly for dealing with heavy engine work, dynamo and motor castings, crane castings, etc. It combines horizontal and vertical milling, profiling, boring, and drilling. The spindle heads are made right and left handed, the spindles approaching towards the inner edges, a device which is adopted to enable them to be operated closer to each other than when they are placed centrally on their sliding carriages. Another feature is the fitting of a horizontal spindle to the left hand head, or to both, if required. This permits of the facing of a vertical edge or edges without having to reset the work, and without the extra expense of having separate heads for horizontal spindles. In the case of engine cylinders and beds, of some connecting rods, and other parts where faces occur at right angles, the supplementary spindle is most advantageous. The movements of the spindle carriages are by hand or power. The spindles are of 5 in. diameter in the machine shown, and are double and treble geared. They run in double coned bearings of gunmetal, with provisions for taking up wear. The bottom bearings slide on their carriages, and have self-acting and hand-operated feed motions through change wheels, to adapt them for drilling and boring. Each spindle has a range of movement covering the whole breadth of the table. 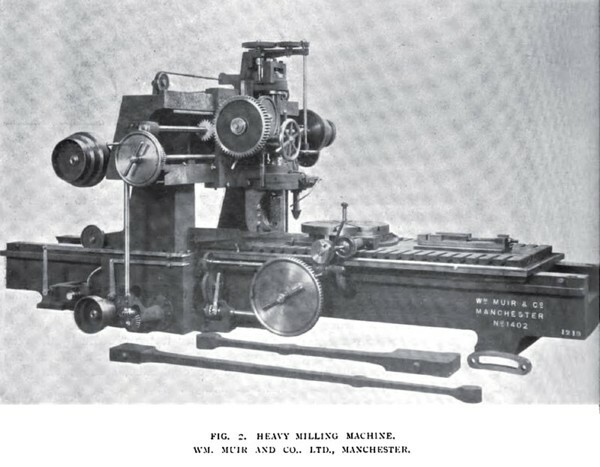 All the essentials of a high class machine are embodied, such as independent automatic disengaging motions to the cross feeds of both spindle heads, variable cross feeds, counterbalanced cross slide, steel rules fitted to the uprights, to the cross slide, and to the spindle slides; pump and connections, trough round the table, automatic table feeds with adjustable stops, cut gears, belt tightening device, etc. Each head is also fitted with a guide spindle for profiling. 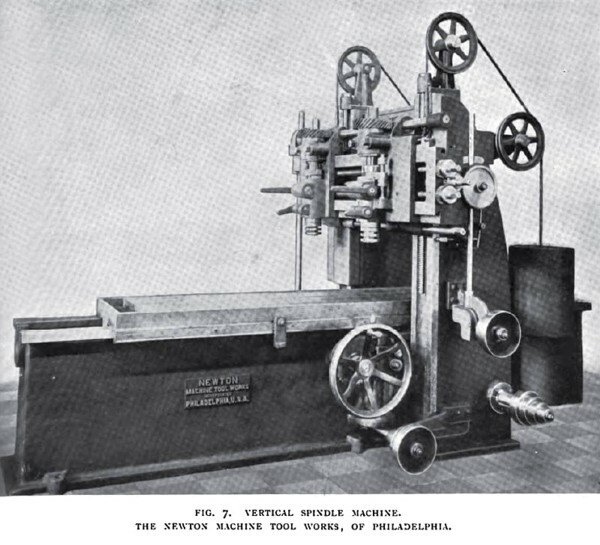 The combination of so many features in one machine, in which, by the way, the utility of neither one is lessened, or weakened, renders it of especial value in general engineers' shops. On a single piece, horizontal and vertical faces can be tooled, holes drilled or bored, and portions profiled, all at one setting, without disturbing or shifting the work. It is capable of profiling work up to 20 ft. in length, by 1 ft. 6 in. in breadth and 1 ft. deep. The very perfect provisions which are made for the various movements of the spindle, and to ensure the durability of the fittings of its various parts are illustrated by the sectional drawing in fig. 6, in which the spindle and its head are shown in relation to the cross slide, A. All the fittings except the main castings are either of steel or gunmetal. 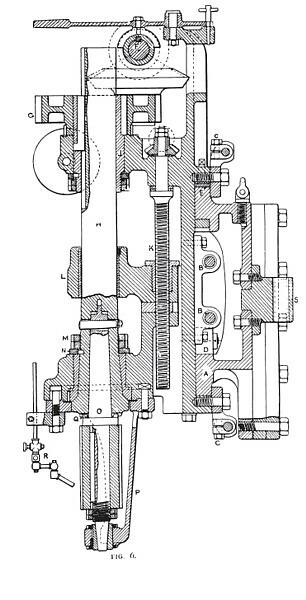 The movements of the two spindle heads on the cross slide, A, are derived from the feed screws, B B. These are tripped by means of clutches and levers, seen at the right hand end of fig. 5 operated from the rods on which the dogs, C C, are adjusted. The friction of the carriages on the cross rail, which is a matter to be considered in profiling, is minimized by the fitting of rollers, D, running on the inside edges of the lower face of the cross slide, besides which the take-up strips, E, on the upper edge of the slide are of gunmetal. Each milling spindle is driven from the horizontal shaft, F, whence a nest of bevel wheels, with a clutch reversing motion, slid to right or left by the lever seen above, drive to a pair of spurs; the larger one of the latter, G, driving the spindle. H. It must be noted, however, that this wheel does not fit directly upon the spindle, but on an intermediate sleeve, J. so that the latter, which runs in the bearing, thus takes the strain, relieving the spindle of it. If the wheel, G, were sliding directly on the spindle, the pressure of the driving would push the spindle against one side of the bearing, and quickly spoil it for accurate milling. The pressure." however, coming on the sleeve, J, preserves the spindle; and this precaution is also even more necessary in belt-driven spindles, in which the pull is very severe. The vertical feed is imparted to the screw, K, through bevels above. on another shaft; the screw running in a gunmetal bush, with adjustable nut, in the bottom spindle bearing, L. The arrangements for taking up wear fitted to this, comprise the steel lock nuts, M, and friction washer, N. The double coning of the neck, in the most approved lathe fashion, will be noted, designed with the object of preventing the risk of the spindle seizing in its bearing, which is further rendered improbable by a gunmetal bushing, and by an oil groove around the washer, N. Wear of the faces of the wheel, G, and boss, above, is taken up by means of similar lock nuts and washer. The arbor. O, has a taper shank, of 1 in 20, and is secured to the spindle nose by the tongue at its end, and a cotter with screwed tail. To further assist the driving, and to relieve the cottar of strain, claw-shaped jaws, Q, are cut on the end of the main spindle, and these engage with claws on the arbor, so that the drive is as close as possible to the cutter. The lower end of the cutter arbor is supported in a gunmetal bush, with adjustment for wear, the end and the bush fitting by a taper of 1 in 6. This bush is carried and adjusted in the swivelling stay, P.
The machines manufactured by the Newton Machine Tool Works, Incorporated, of Philadelphia, Pa., are mostly of a massive character, chiefly for slabbing work. One of these, with two vertical spindles, is shown in our illustration (fig. 7). Here the spindle drive is effected very smoothly through spiral or angle wheels. A length of 8 ft. can be milled on this.